Located within walking distance of Chania, Chrissi Akti (also known as Golden Beach) and Agii Apostoli are popular with locals and can get busy in summer especially at weekends. 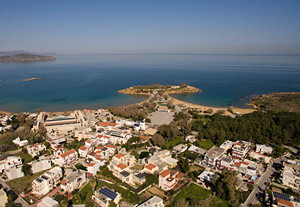 Located very close to Chania with easy access on foot, by public bus, taxi and car. Plenty of small hotels, quite a lot of self-catering studios and apartments. Not many restaurants, probably because Chania is so close by. 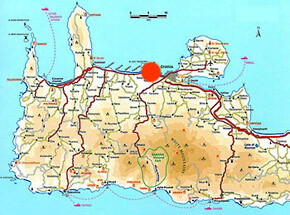 There are a few large shops nearby (Synka supermarkets, AB, , Lidl) otherwise the town centre is not too far. You will need to go to Chania. Excellent sandy beaches. The water is shallow so it is safe for children. One of the beaches has a play area for children. It gets crowded, especially at the weekend because the beaches are very popular with the locals (close to town). A good base if you want to be close to town without being in it. Also excellent if you have small children because the sandy beaches are safer than most beaches on the northwest coast.